I have been loving the flower crowns I see all over Pinterest lately. They are just so festive and bright; perfect for that summer party or concert! Here is a simple DIY to show how you can make your own. This can be done with fresh or silk flowers. My mom is getting married next week and I thought it would be fun to make a flower crown/collar for her dog to wear. Whether you are making a collar or a crown, the same steps are needed. I found all the above (besides the scissors) at my local craft store. I believe Michael's would carry these items as well. I was lucky that some of the flowers I used already had wire in the stems. This made the attaching a lot easier. Create a circle with the heavier wire that fits comfortably around your head or the neck of a dog. As shown above, fold the ends of the wire over and hook them together. 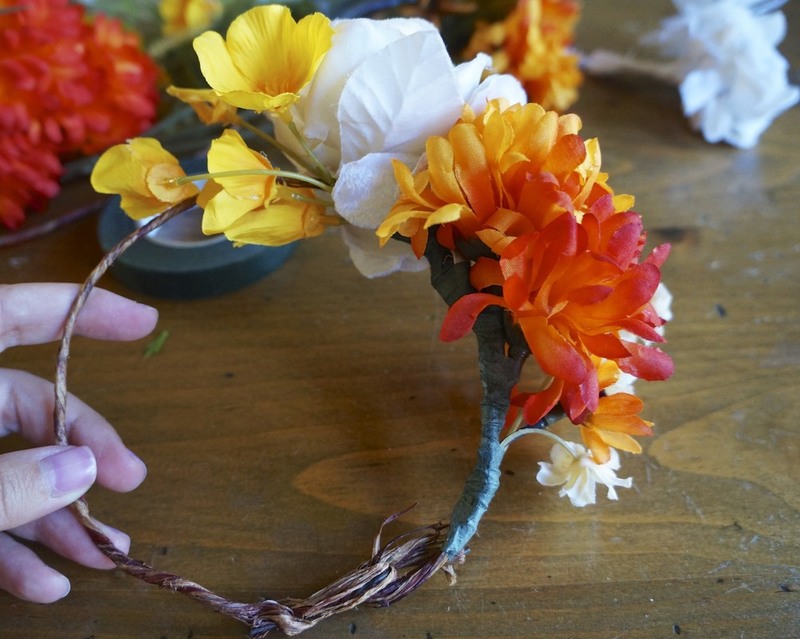 Pick out your first bloom, lay it against the circle you have just created, cut the floral wire to be about 5 inches and wrap it tightly around the stem, attaching it to the circle. Take the floral tape and wrap it around the wire so that the flower is secure. Continue this around the circle, laying the flowers next to and behind one another until you get the desired fullness and look you desire. There are two ways to finish this crown. One is to keep the hooked end open so you can clasp and unclasp it as desired. This might be preferable when wearing this as a crown. The other way is to continue to put flowers all the way around it so that no wire is showing. I ended up doing this because I could pull the collar over the dogs head and it looked better around her neck that way. The two ways are shown in the pictures below.